Earlier this year, I was flung into the world of fermentation when my first bottle of sauerkraut exploded in my Harvard dorm room. I was half asleep when I heard the ssssssssss pop BANG and a plume of sulfuric air hit my face. I immediately jumped out of bed, turned on the lights and saw my purple sauerkraut splattered all over the walls. This was mistake number one. Mistake number two was forgetting to take out the sauerkraut trash until two weeks later—when I went to push down my garbage, a cloud of fruit flies erupted from my trash can. To my horror, hundreds of these pesky flies buzzed around my room for days, a constant reminder of an experiment gone terribly wrong. But this insane sauerkraut debacle was just the beginning of something quite beautiful—my love for a super-funky science, fermentation. This year I’ve had the opportunity to take a deep dive into fermentation, where I’ve learned about some pretty strange products with extraordinary stories. But of all the surprising fermented delights in this world, one product stands out from the rest: sake kasu. Sake kasu is a beautifully aromatic, flavor-rich, living thing with so much potential as a cooking ingredient, yet few people know about it. This charming by-product comes from the sake-making process, where steamed rice is inoculated with a fungus called koji. Koji releases amylase enzymes, which break down rice starch into sugar; then yeast is added, which converts the sugars into alcohol. After 27 days, the fermented rice mash is pressed and the liquid—the sake—is drawn off. The solid that remains behind is sake kasu. Not only does sake kasu have amazing flavor, it also contains active ingredients like yeast and enzymes which can be creatively leveraged in many different recipes. It’s also thought to have potential health benefits because of its high levels of protein and vitamins. No one knows more about this ingredient than Todd Bellomy, co-owner of Dovetail Sake, who studied sake making for seven years in Japan. I had the pleasure of visiting Todd at his brewery in Waltham, MA, and it was here that I developed a curious appreciation for sake kasu. In Japan, sake kasu is a very common product that is used in a variety of ways. Most sake kasu is snatched up by the Japanese cosmetics industry and processed as a skin-care product because it’s thought that kasu is somehow responsible for the age-old tale that elderly sake brewery workers have youthful looking hands compared to their wrinkled faces. But traditionally, sake kasu was used simply because people didn’t want to waste it. The Japanese have a culture of “no waste,” a sentiment that is clearly reflected by my Japanese grandmother. When I cook with her, she’s always telling me, “Don’t throw that out, Evan, because I can use it.” In cooking (and life in general) my grandma feels a lot of regret when throwing out something that she believes has intrinsic value. Part of this is ingrained in our culture and stems from Japan’s religious origins, Shinto and Buddhism. In Shinto, it’s believed that all objects have a spirit, or kami. In Buddhism, the tradition emphasizes a life of frugality to attain enlightenment. Thus, it should be no surprise that Japanese cooking operates partly from this religious syncretism, instilling a general aversion to waste. In this spirit, the Japanese have found many ways to use sake kasu. In the countryside, kasu is flattened, toasted over a grill and eaten like a cracker as a no-waste source of nutrition called kasu senbei. Kasu is also used to create a funky pickle called kasuzuke. This involves a process by which fish and different kinds of vegetables are covered in kasu and allowed to ferment. The result is a pungent but tender pickle that many people associate with traditional Japanese cooking. Kasu is also sold in packages at the grocery store, and home cooks can be found using it in their bread, ice cream, cheesecake and amazake, a thick fermented rice drink. A great resource for these recipes is cookpad.com. Under the search phrase “sake lees” you’ll find a community of home cooks who are uploading their own unique recipes made with kasu. Despite the countless uses for sake kasu, for a commercial sake brewer it can be quite difficult to utilize it all. Todd estimates that of a 700-liter batch of sake, about 33% of it comes out as kasu. That means every month he produces about 250 liters of kasu and must find ways to not waste it. One way that Bellomy handles his excess sake kasu problem is by giving it to local restaurants that sell his sake. 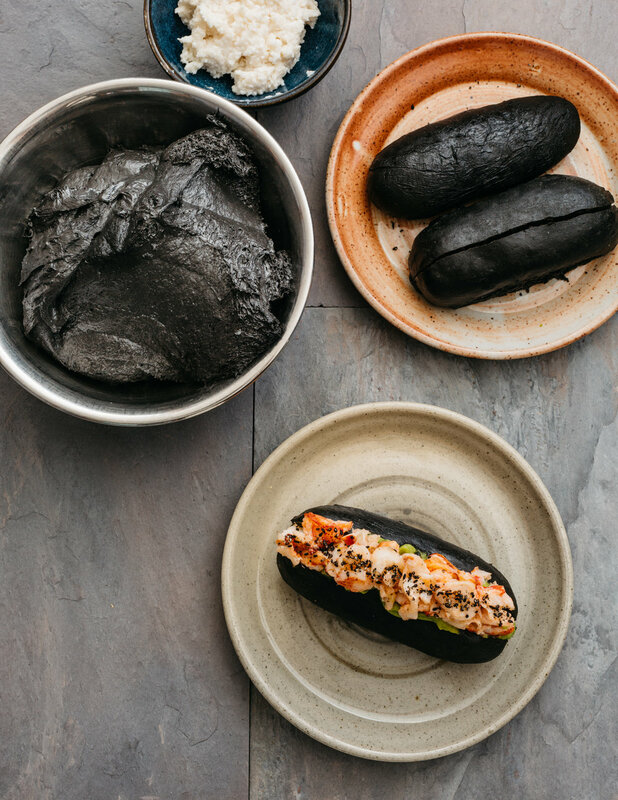 The creative chefs at PAGU, Tasting Counter and Banyan have found inventive ways to incorporate Dovetail’s kasu into their menus. 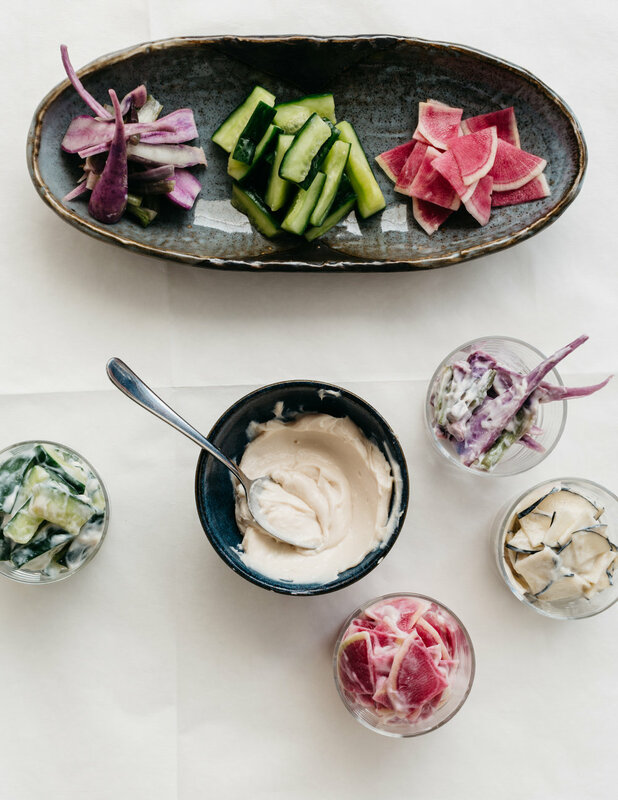 Tasting Counter, located in Somerville, is another restaurant where you can find Dovetail’s sake kasu featured on the menu. Owners Peter and Ginhee Ungár use kasu in their red sea bream dish, which features a Dovetail Sake–brined fish, covered in a kasu butter sauce and plated with kasu gel dots with a pinch of confit lime. Phil Tang and Tom Griffin, former chefs at Banyan Bar in Boston, were true sake kasu innovators. Their journey began before they even knew about kasu, when they were playing around with a yeast-fermented rice porridge called jiuniang. 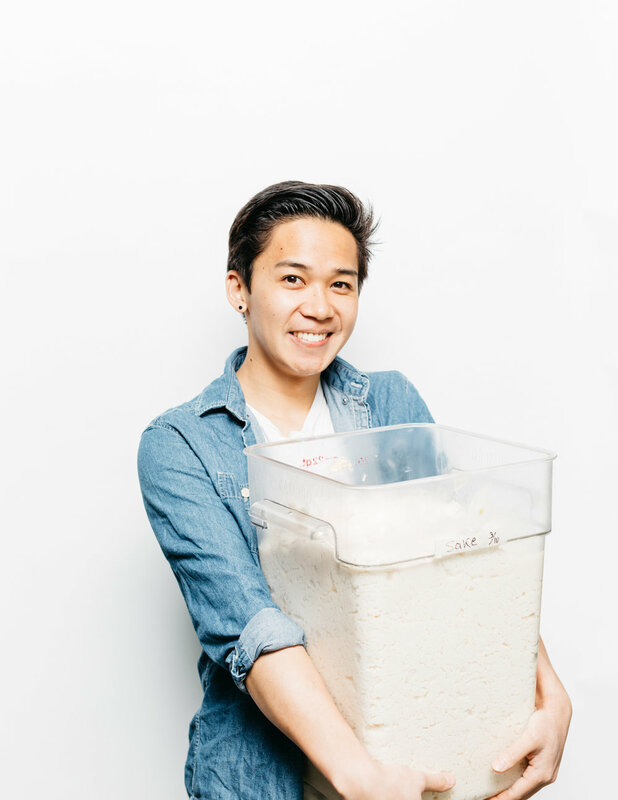 They used this “cultured rice” to ferment kimchi, so by the time Bellomy came through with his giant bag of sake kasu, they already had an idea of how they wanted to use it. They put the sake kasu into their kimchi, pickled lots of different vegetables and even used it in beurre blanc and crème brulée. They tried dehydrating it and milling it into flour, but the intense heat of the dehydrator ended up caramelizing it into a sort of fruit leather. Undaunted, they used the fruit leather in rice wine vinegar. But perhaps Tang and Griffin’s most successful recipe was their sake kasu-marinated mochiko chicken served with togarashi biscuits, maple syrup, kasu butter and kasu-fermented plum sauce. This “KFC bucket” so perfectly shows how versatile this ingredient can be—the chefs used it as a marinade, a seasoning and a fermentation catalyst all at once. Inspired by all of these kasu chef-scientists, I decided to try my hand at a few basic recipes. I used it in no-knead bread, sauerkraut, yogurt and even mead, but I quickly discovered that haphazardly throwing kasu into a jumble of ingredients doesn’t necessarily make them taste delicious. What drew me to this product in the first place wasn’t that it was some miracle flavor agent that could magically transform poorly executed dishes into culinary masterpieces. Sake kasu initially caught my attention because it’s a waste product, and we usually have such defined perceptions of what we can and can’t do with waste. Yet, through my research I find our community working together to reimagine what they can do with something that’s usually thrown out. I wanted to find a way to bring my research on sake kasu to the Harvard community so along with my friend Jessica Scazzero, I decided to organize a cooking workshop to see if our friends could come up with some better ways of using this by-product. We showed people how special sake kasu is and walked them through a series of tastings highlighting where it comes from and the different ways it can be used. Then we asked them to create their own dishes. A few examples from the whiteboards full of ideas: pancakes made with banana, beer and kasu; deep fried kasu-marinated fish and chips; lobster sautéed in kasu butter with kimchi; and kasu-pickled strawberries with mint and watermelon. Fermentation is an incredibly powerful tool for creating new and exciting flavors. But it also has tremendous potential as a tool to repurpose waste. And in the food world, where scraps are made at almost every step in the process, there are a lot of different ways we could be thinking of using fermentation to transform “garbage” into food.